There are situations in dental practice that we find so disconcerting that it makes it difficult to approach them rationally and scientifically to find a resolution. One of these is when a ceramic restoration de-bonds. Usually int he moment I am frustrated and upset, and the patient is frustrated and upset. This makes thinking analytically challenging, but being able to do this is critical. What I want most is to know why the ceramic restoration came off and how to minimize or better yet eliminate this from happening in the future. For me there is a critical “first question” that has to be asked. In order to answer this question I need to be able to examine the tooth and the internal surfaces of the ceramic with my loupes on, and I need an explorer. Often being able to visualize the resin is a challenge, especially if it is translucent, and thin. The resin will turn grey when we scratch over the surface of it with an explorer, so this test can be helpful. If the resin is all attached to the tooth and the ceramic interface is clean I need to think about the process of bonding to the ceramic. This may mean that the ceramic was not prepared properly. Different types of ceramic require different etching times and percentages of hydrofluoric acid, or are prepared with air abrasion. The ceramic may have been contaminated with oil from our hands, saliva, blood, try in paste or die stone and not cleaned properly. The ceramic also requires conditioning with products like silane or Monobond Plus and it is this step that may have not worked properly. Alternatively if all of the resin cement is on the ceramic and the tooth is clean I have a different set of options for what happened. The tooth has to be cleaned to thoroughly remove all trace of the temporary cement. Both the enamel and the dentin need to be etched, and whether using a total etch or a self etch technique this may be where the issue occurred. I also take a second look at the prep at this point and ask myself about the amount of enamel I have versus dentin, and is it secondary dentin which can be very problematic when bonding. I also may need to look at my dentin adhesive technique, making sure we followed the steps accurately and rethinking whether the tooth could have gotten contaminated during the process due to poor isolation. Lastly, sometimes there is resin in both places, some on the tooth and some on the ceramic. In this case I rethink the occlusal forces on the tooth and the functional design. This may be a patient who has higher functional risk, or I may have missed the mark in the precision of adjusting the final occlusion. When the resin fails under load you most often find it in both locations. Identifying where the resin is located allows me the opportunity to target my problem solving and decrease the risk of the same technical issue in the future. Thank you Lee! Good thought process. My question is how do you know which etch and cement system to use if you didn’t place the crown and are unsure of the type crowd material? Trying to get a do over when an all ceramic crown de-bonds is difficult under the best of circumstances, and harder still if you did not do the original. Being able to tell the difference between e-max and other ceramics visually is not something I can do, Zirconia is easier due to the high value, and easier still if there is a core. Even if you know what material the bigger challenge is removing all of the previous resin and creating a new surface to which you can successfully bond. 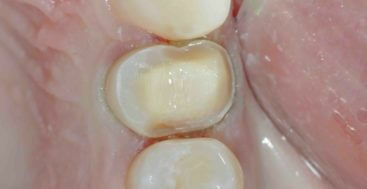 I typically use micro-etching/air abrasion for this on both the tooth and the intaglio of the restoration. I use a universal coupling agent like Monobond Plus, which works on all the different ceramics and lastly I tell the patient that bonding a second time holds a certain amount of unpredictability. 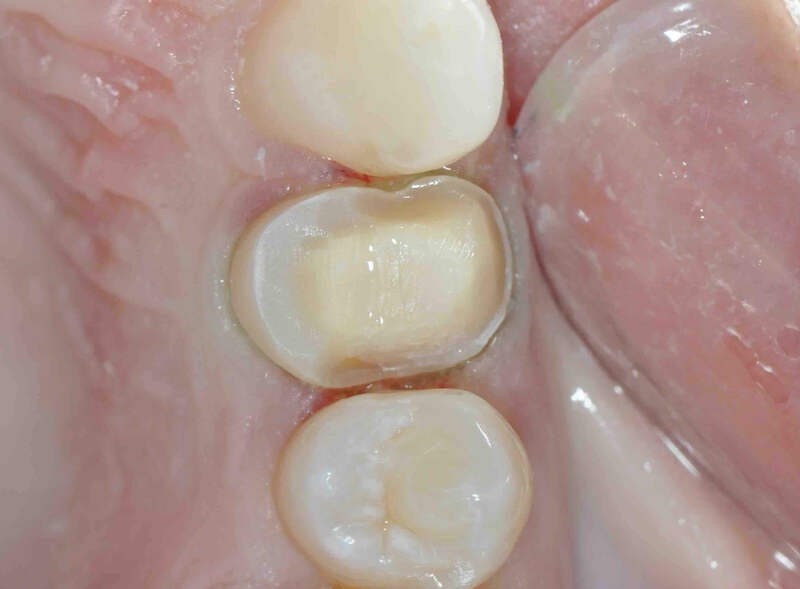 You can also temporize the tooth and send the restoration to the lab and get their assistance in removing the resin and returning the internal of the ceramic to a more favorable surface for bonding.